where's the best in 2015 & 2016? We're a little late for 2016 retrospectives, but it's taken us all of January to cover our last (and often best!) eats of last year. And it's been almost two years since we properly updated our where's the best? page, so we've taken the week to do it right. Let's begin with a moment's silence for past faves now departed: veg Chinese institutions Enlightened Cuisine and White Lotus Vegetarian Restaurant, plus those amazing mock chicken wings out at Springvale; the Aussie-as why-in-South-Yarra Sweetwater Inn; the feelin'-just-a-bit-fancy Bayte and Otsumami; for sweet little Helados Jauja. and that one time Michael ate a second serving for dessert. Thankfully we've been blessed with numerous new haunts. Our local 'hood has welcomed Good Days and Very Good Falafel, and we love the Tamil Feasts project. Brunswick St is still booming, with omni spots Mukka and Rue de Creperie giving the local all-veg businesses serious competition. We've found amazing vegan foods in places we daren't dream of, like Italian restaurants (Small Axe Kitchen, Maccaroni Osteria Italiana) and Irish pubs (The Snug, in both Brunswick and St Kilda). Some great eateries have had babies! Smith & Daughters begat Smith & Deli; Moroccan Soup Bar begat Moroccan Deli-Cacy; Fina's begat Fina's Jr 2; Vegie Bar begat Transformer. And we've finally visited two grandparents of the veg scene thanks to our Cheap Eats 2006 project - it should never have taken us this long to tick off the lovely Friends of the Earth and Water Drop Tea House @ Fo Guang Yuan Art Gallery. In our home kitchen, Ottolenghi and Isa still reign supreme. Our O-club favourites included sweet potatoes with orange bitters, pumpkin with chilli yoghurt & coriander sauce, roasted cauliflower, grape & cheddar salad and eggplant cheesecake. Isa gave us chipotle sausage hash and that was enough. We're getting good use from other cookbooks, too, with wins from Community (char-grilled broccoli with chickpeas, almonds, lemon & chilli, ginger-peanut kale with tofu and quinoa), Vegan Soul Kitchen (spicy Cajun-Creole tempeh with creamy cashew grits), the Moroccan Soup Bar cookbook (basbousa) and the Smith & Daughters cookbook (hot cheddar & pickled jalapeno dip). Our repertoire of easy-peasy weeknight cooking has expanded to pan-fried gnocchi & kale, orange baked tofu and Trailwalker macaroni; if they were a little more nutritious I'd wrangle roasted jackfruit rolls and sweet'n'sour mock pork in there too. On the other end of the scale, gochujang fried cauliflower and PB potatohead icecream were outstanding weekend projects (I'm still on the fence about that waffled tofu & rice...). In my world almost every dessert is a good dessert, but the ones we've already made multiple times are these macadamia & lemon myrtle biscuits, this peanut butter & blueberry pie, and Michael's perfected Nigella's winter plum cake. Not only are these recipes delicious, but they conjure happy memories of the the occasions they were made for and the people we shared them with. We took a long overdue trip to Brisbane this summer, to visit family. Mostly we took it easy - jigsaws, beach walks, reading novels, chatting over cool drinks and cheese plates. I ate avocados and mangoes at every opportunity. 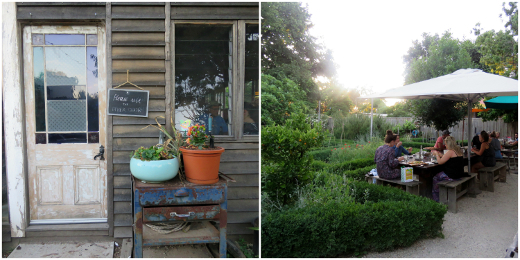 Amid all that we visited just a couple of veg*n cafes that have sprouted up recently. Vegan 'superfood bar' Charlie's Raw Squeeze has nine outlets around town, with more in the works. One is on the Redcliffe peninsula, where I grew up - this area has certainly evolved from those days of Sizzler and KFC. Charlie's Clontarf is staffed by numerous fresh-faced young women, who whip up juices, smoothies, acai bowls and banana-based 'loaded nice creams'. Mum & I stopped in for a browse right from the airport. We took away a taco bowl (~$12, not pictured) to share for lunch - we were impressed by the walnut mince and the bean salad, and glad for the fresh veges on a hot day. We browsed the Vegan Pantry, where I spotted all sorts of non-perishable goodies I've come to love in Melbourne - mock meats and dairy, icecreams and chocolates, lip balm, nooch, and on and on. An old high school friend and I laughed at the incongruity of meeting up there for breakfast. Instead of the popcorn and Burger Rings we once shared, we picked out acai bowls. I was delighted by my small bubblegum bowl ($12) with its frosty base of blended acai, dragonfruit and coconut water and cheery fan of apple and banana slices, chopped mango, coconut chips and cocoa nibs. 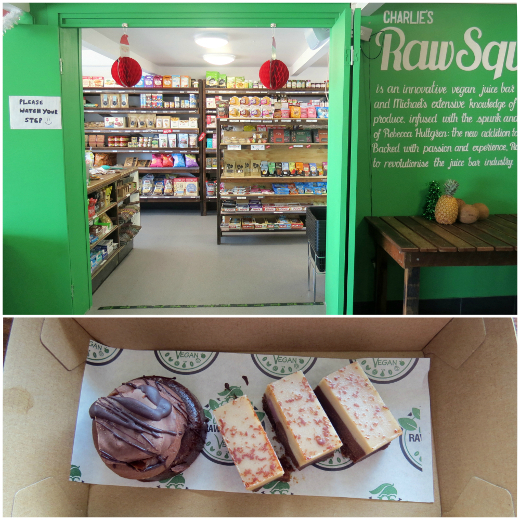 I don't whole-heartedly endorse Charlie's superfood ethos, but their fresh foods were great summer holiday treats. I hope they'll see great success in my hometown. Next door to Charlie's Everton Park is Veganyumm, a bakehouse with all the white sugar, flour and non-raw foods that Charlie's avoids. I persuaded my Mum that we should lunch there after picking Michael up from the airport. Though most of Veganyumm's customers seem to pick up their choice of desserts and leave, there are a few tables available for sitting in. We made good use of them, enjoying the shade, the people-watching, and the time to gaze across the sweets and consider the best combination for dessert. For those of us taking a seat, there are a wide range of beverages to sip. The usual coffee menu extends to red velvet and turmeric ginger lattes; tea comes in a variety of colours, hot and iced; and then there are milkshakes, frappes, and fruit whips. 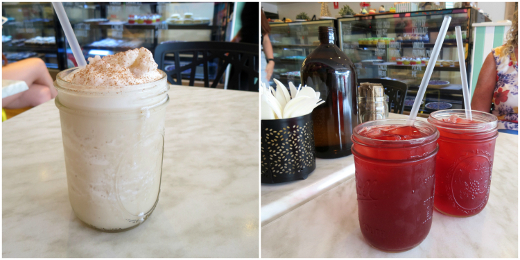 I loved their gently sweet and very icy chai frappe, while Michael and Mum had berry iced teas. Savoury options are limited but hearty. Their pumpkin pies were huge, flat rectangles formed from puff pastry sheets, stuffed not just with pumpkin but with tofu and mixed vegetables. A vegemite scroll was served warm and fluffy - I've never been a big cheesymite fan but this rendition won me over. Sated for the time being, we negotiated sweets to take home and agreed to a wedge of chewy pecan pie, silky peanut butter chocolate tart, and a melting moment. The latter was our unexpected favourite, with its gorgeously tangy passionfruit icing. All these desserts are great ambassadors for the joys of vegan eating, and happily they seemed to have a bit of a following in suburban Brisbane. For one day Michael and I roamed the city centre, meeting up with friends, bumping into others, and checking in on GOMA's anniversary exhibition. 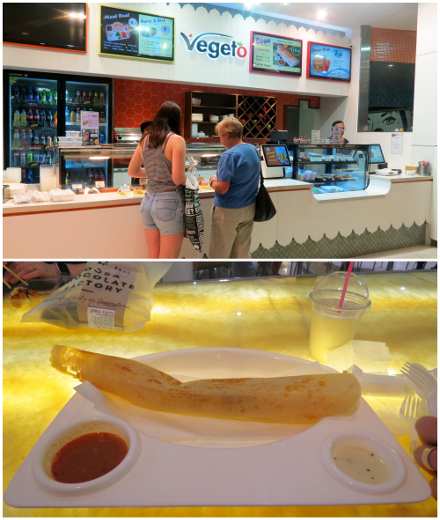 Tucked into a shopping centre food court, vegetarian-Indian stall Vegeto was a neat spot to grab a quick meal. Their dosa ($8.80) weren't extravagant but they really hit the spot; I paired mine with a ready-made mango lassi. Sharp eyes would've seen a tell-tale bag in that dosa pic - yep, we stopped by the Noosa Chocolate Factory outlet for their signature vegan rocky road. We did our best to pack it coolly and safely to share with friends back in Melbourne but as the chip packets say, some settling of contents may have occurred during transit. This chocolatier was absolute chaos in the lead-up to Christmas, so we took a raincheck on the vegan-friendly hot and iced coffees and chocolates we noticed on their menu. Fancy dining was never a goal for our Brisbane visit, but we had fun at these few newer spots we checked in on. Almost inevitably, the much-hyped cookbook from local favourites Smith & Daughters was part of Cindy's birthday present this year. It was no surprise - I'd had to tell Cindy to hold off buying it herself so that we didn't double up. To add to the birthday excitement, I threw in an offer to cook up Cindy's choice of dishes for the night. It wound up being quite a feast - hot cheddar and pickled jalapeno dip to start, artichoke and chickpea salad for main, horchata to drink and melon salad with pickled pineapple and jalapeno for dessert. The horchata wasn't a complete success (I think our food processor doesn't quite have the power to get the rice liquidised properly), but everything else was a hit. Cindy loved the pickled pineapple when we tried the fruit salad for brunch last February, and we've already made it again - the blend of sweet, spicy and sour flavours is incredible. 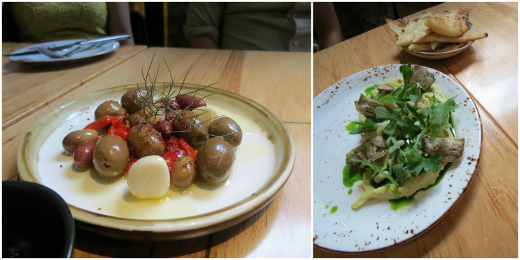 The artichoke salad was similarly great, another dish we loved in the restaurant that lived up to our memories. The star of the night though was the hot cheddar and jalapeno dip, which again we'd been impressed by at the restaurant. It's surprisingly easy to throw together - one pot and about 10 minutes and you've got a gooey, cheesy, slightly spicy dip that's perfect for dunking chips in or pouring over just about anything else. We'll just reproduce the cheddar dip here - I'm sure we'll add a few more recipes in dribs and drabs over the coming months, but you'd do well to duck out and grab this book for yourself. Melt the margarine in a saucepan over medium heat. Add in the garlic and cumin and stir everything together, cooking for a minute or so. Add in the flour stirring constantly. Cook for 2 minutes or so, making sure it stays reasonably smooth and doesn't brown. Slowly add the soy milk, whisking constantly to keep things smooth. Add in the mustard, nutritional yeast, cheese, jalapenos, pickle juice and salt and stir everything together. Once the cheese melts you should have a thick, gooey dip - add more water if it's too thick or cook for a bit longer if it's too runny. Rue de Creperie sits in that strip of Brunswick St that's full of veg*n eateries. It's not entirely vego but their street board promises vegan options. They really deliver, too - the savoury galette batter is vegan and gluten free, and the sweet crepe batter is always vegan, with a surcharged gluten-free option. Toppings are above and beyond the usual - they've got vegan cheese, icecream, chocolate sauce and caramel on hand, yielding more than a dozen options all up (majority sweet). For all that, our touring friend went for the classic lemon and sugar crepe ($9) - like all the sweet vegan crepes, it comes with a scoop of coconut Zebra Dream icecream. Michael stuck steadfastly to savoury for breakfast, ordering a galette filled with mushrooms, spinach and sufficiently-melty vegan cheese ($12). In contrast to my milder-mannered companions, I went all out with a Thailand special ($13): a parcel stuffed with bananas, liberally spread with soy condensed milk, topped with a scoop of coconut icecream. It was incredibly sweet and utterly delightful. The atmosphere at Rue de Creperie is low-key and welcoming, I reckon this is a place where you can relax and chat a while. There's so much more I want to go back for: the Stawberry Heaven, Banana Split, Salted Caramel, the Pear Belle.... Given how allergen-friendly the menu is, I should have no trouble rounding up friends to join me. Rue de Creperie has already won fans in blogs TRAVELLYAN, Latitude Liv and Fire & Tea. Accessibility: There is a small lip on the doorway. Tables are densely arranged with a wide, clear corridor through the middle. We ordered at our table and paid at a medium-height counter. We didn't visit the toilets. 23/03/2017: Unfortunately the St Kilda Snug is now closed! You can still visit them in Brunswick. 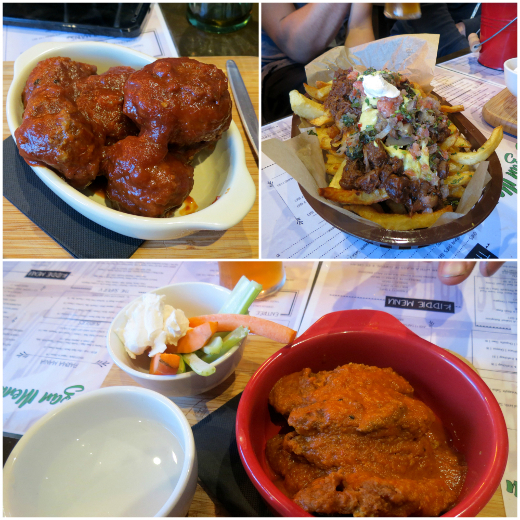 We had a good time checking out the new vegan options at The Snug in Brunswick and heard rumours that the St Kilda branch was even more impressive. Cindy and another friend scheduled their big joint birthday dinner there so we could check it out - we filled up a couple of the outside tables on a busy Saturday evening. The menu is ridiculous - more than 50 vegan or veganisable dishes with an emphasis on mock meat and fried food (although there are a handful of healthier options if you're that way inclined). Think The Cornish Arms with a bit more traditional Irish pub food. We kicked things off with a round of fried treats for the table. The battered sausages ($10) are more batter than sausage - gloriously oily lumps of fried that are not for the faint hearted. I ate more than my fair share of these, which left me struggling by the time the meals came out later. Things got even more intense from there with - clockwise from top left - popcorn chicken in BBQ sauce ($10), Texan loaded fries ($14) and the chicken wings ($14). The wings didn't quite measure up to the glory of The Cornish's version, but the ridiculously loaded fries (topped with bbq pork, pineapple salsa and sour cream) and the BBQ popcorn chicken were ace. I was struggling to breathe by this point, so the arrival of the main meals was a bit overwhelming. The Irish parma ($21) arrived topped with parsley cream, kale and rice paper bacon all astride a ludicrously big serve of mashed potatoes. This was a solid performer - the parma itself was probably just something from the supermarket freezer, but the toppings were great and the meal was impossibly large. We also ordered a southern fried chicken burger ($18), which was a straightforward combo of a spicy chicken patty and some chipotle slaw, alongside another massive serve of chips. I really liked the burger, but I was so full I couldn't really do it justice. 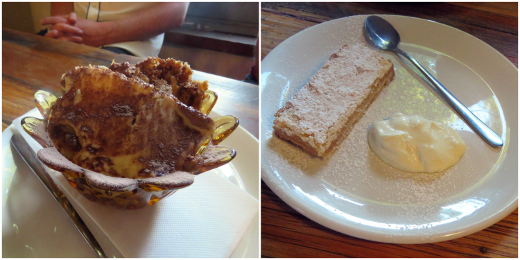 One of our friends skipped out on all the salty action and decided to have dessert for dinner - her banoffee pie with chocolate shavings, ice cream and banana fritters ($12) was a hit, but dessert seems like an impossible dream for anyone brave enough to order one of the mains here. We capped the night off with a wander down to the St Kilda breakwater, which was positively teeming with little penguins - it's crazy to find this thriving colony so close to the city. It was the perfect way to end the night. There are a huge range of vegan options at The Snug and we definitely had more hits than misses among our big group. The prices aren't super cheap, but the portions are crazily large and the service is friendly. It's a welcome south-side addition to the city's vegan pub scene. We enjoyed dinner at the Brunswick branch of the Snug. 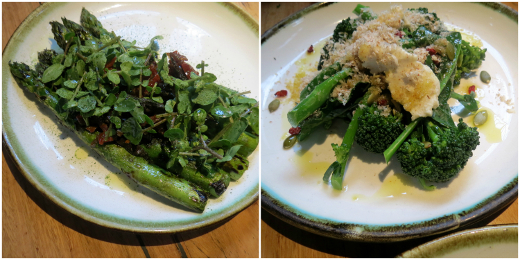 The Rose and Bean and Veganopolous have reviewed the vegan food at St Kilda. Accessibility: There's a flat entryway into a pretty crowded interior. The tables in the outdoor area are up a few steps. We ordered and paid at a high bar and didn't visit the toilets. In December an old friend returned to Melbourne for a week. She's vegan, and was equally excited to revisit her old faves (Yong, Casa Del Gelato) and catch up with the new veg eateries that have popped up in the past 3 years. We booked in a Friday night dinner at Transformer as part of the latter project. To ensure a good spread across the menu, we took our first shot at the chef-selected Feed Me option ($55 per person on a Friday, without dessert) and requested that everything be vegan. While we picked drinks, we grazed on a small plate of mixed olives, roast peppers, pickled garlic for the brave, and a little chilli. We also scooped up the dip plate with gusto; it was a savoury-creamy arrangement of white bean dip, artichokes and caperberries with an impressively doughy gluten-free flatbread. The bread was pretty great dredged through the olive's marinade too! These appetisers were rapidly followed with salads. The first was a study in astringency - fennel, grapefruit wedges, green olives, bitter leaves, a vinegar-based dressing and super-salty green wafers. 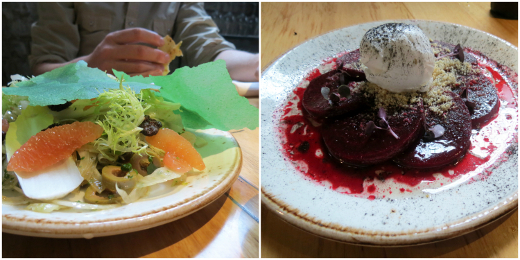 The beetroot carpaccio was very mellow by comparison, crowned with a ball of cooling vegan labneh. The steamed buns were perfectly balanced on their own, featuring battered tofu, pickled cucumbers and gochujang mayo. We happily gorged on greens, too! Fat, juicy asparagus spears were flavoured with concentrated little sun-dried tomatoes and mushrooms and topped with watercress; broccolini was simply steamed, then scattered with pumpkin seeds and barberries, teamed with more vegan cheese. We were ready to conclude there, but the meal's main dish was yet to arrive. It centred on melt-in-the-mouth cumin-braised eggplant in a pool of chemoula, crested with quinoa crisps. A three-rice pilaf with sprouted lentils, chickpeas, pomegranate seeds and fried onion helped us sop up all the sauce. While individual dishes at Transformer always look expensive, we were satisfied with the quantity of food on the Feed Me menu. We thought the summer selection was dud-free, and all nominated different favourites. In fact, at the end of a week's dedicated vegan feasting, our friend circled back on this as her favourite meal. I'd report just one misfire in the service. We'd booked an early table that needed to be vacated by 8pm. I was aware of this when booking, and on arrival the front of house told the three of us again, once each, and our waiter mentioned it two-to-three more times at the table. Even when they're politely delivered, hearing "please leave by 8pm!" six-to-seven times had me feeling less than welcome. Nevertheless, we enjoyed our night at Transformer immensely and it impressed our out-of-town guest even more than we'd hoped. It'll be at the forefront of our minds for future fancy veg dining. 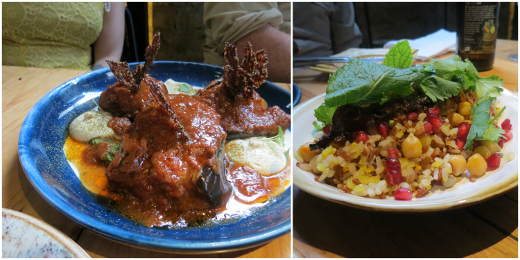 You can also read about one, two of our previous visits to Transformer. Since then it's received positive coverage on Couchfoodies, quinces and kale, kT eats world, Fire & Tea, Skinny Glutton, Champagne & Chips (a partial freebie) and lillytales. There are more negative accounts on Chasing a Plate, A Chronicle of Gastronomy and Eats By DonutSam. Accessibility: The entry is wide and with a shallow ramp. Tables are well spaced, a mix of mid-height tables with booths and backed chairs, plus higher tables with backless bar stools. There's full table service. The toilets are highly accessible - individual unisex cubicles with marked wheelchair and ambulent options. Until last month all I knew of Avenel was its Hume Freeway roadhouse, a stop on the bus route between Melbourne and Albury. Now this town is home to one of my aunts, and she proudly showed us round one weekend in December. We missed the nearby Xmas Twilight Market by a day, and instead walked along the Goulburn River before dining at Bank Street Wood Fired Pizza & Garden. This pizzeria is hardly a local secret. Not only does it appear in local tourist guides, but it's attracted reviews in the city newspapers and definitely requires a reservation on a Saturday night. They make a good first impression - the side-path entry leads to a view of a lovely back garden, before you can let yourself into the renovated bank building to be warmly welcomed by one of the staff. Although they were evidently busy, they didn't mind running through food and wine details with us and everything was served with a smile. As you'd expect, the menu is dominated by pizza. Vegans and coeliacs will find little-to-nothing that's meant for them, but us dairy-eating vegos are well catered to. Michael was most impressed by Michelle's Magic Mushrooms pizza ($21), which had a heady whiff of truffle oil and some smoked scamorza cheese. I declared the Smooshed Potato pizza ($21) to be the best potato pizza I've ever eaten. The spud-smashing provides both fluffy bites and crispy golden fragments, and they're interspersed with pungent King River Gold cheese, bubbled parmesan, and fragrant sprigs of rosemary. 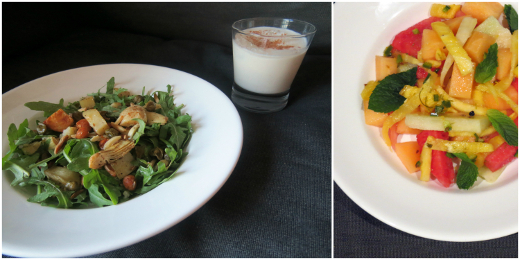 We shared a rocket-parmesan salad ($14), since rosemary just barely counts as a green vegetable. We were having such a good time that we agreed to stow away the last few pizza slices for later, and share a round of dessert. A dolce pizza (filled with Nutella or mixed berries) was out of the carby question but a serve of Cal's Tiramisu ($11) still seemed on theme. It was a hefty, homely serve and I took responsibility for enjoying every last mouthful, even after the other two were defeated. The lemon slice (~$10) couldn't beat Carol's and my shared memory of the one at Albert St Food & Wine, but it was a respectable rendition. Bank Street is a real charmer, casual yet special. Their menu style would fit inner-city Melbourne with its artisan name-dropping, but it's underpinned by a love of local produce and you won't find garden-sourced ingredients or gorgeous outdoor seating like this in Carlton. Bank St Pizza has also been positively reviewed on Melbourne Din(n)ing Blog. Accessibility: Entry requires making your way along the driveway and up a small step out back (see pictures above). Indoor seating is densely packed with a clear corridor through the middle. We ordered at the table and paid at a low counter. We didn't visit the toilets. Edit 03/01/2018: We're sad to report that Melbourne Wok closed late last year. Our mate Gill recently tipped us off about Melbourne Wok, an uninspiringly named restaurant in the strip of Indian and Korean places on Bourke Street. In spite of its bold promise to provide 'Everything Asian', Melbourne Wok seems like a Malaysian-Indian place, offering banana leaf curries for lunch and a wider range of noodles etc at dinner time. We stopped by for a quick lunch on a Saturday, joining a decent crowd of other people keen for the banana leaf experience. At lunchtime your basic choice is vego ($10.90) or non-vego ($12.90) - you get rice, four curries, a raita and a pappadum all served up on a banana leaf. The traditional approach is to eat it all with your fingers - we watched some experts work their way through the meal dexterously, but decided that we'd wind up smearing pumpkin all over ourselves so we opted for cutlery. Cindy kicked things off with a fancy drink - a sirap (rose cordial, $3.40) - a strong and sweet accompaniment to the curry lunch. The vego curries on our visit were a dry spicy cabbage dish, a dal, a smooth pumpkin curry and the star of the show - a delightful spicy/sticky eggplant dish. This was a fabulous lunch - a great mix of flavours that really highlighted the excellence of South Indian vego food. I'm not sure how much they rotate the lunchtime selections, but the eggplant really is fantastic - hopefully it's always on offer. Melbourne Wok is a great addition to the CBD's lunch options - cheap, fast and delicious with friendly staff. The fit-out is pretty basic and there's not a whole lot of atmosphere, but it's the perfect place to drop by for a speedy lunch. We're looking forward to heading back to try out the veggie nasi lemak on the dinner menu. Accessibility: Entry is flat and wide and the interior is reasonably spacious. We ordered at our table and paid at a low counter. We didn't visit the toilets.